If you were the First Lady, what would your trip to the Bay Area entail? More importantly, what would you eat -- and which celebrity chef would prepare your treats at a well-heeled fundraiser? You can find out -- for a price. 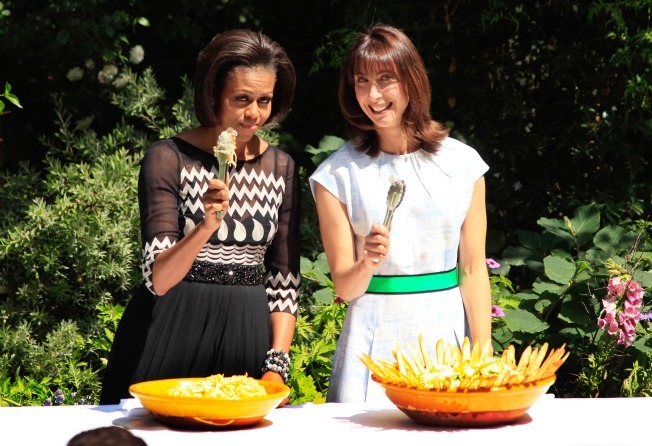 Discriminating gastronomes and well-heeled political power-shakers will witness Alice Waters of Chez Panisse fame preparing garlic toast and other treats for Michelle Obama when the First Lady visits the Bay Area for a fundraising breakfast on June 14th, the Bay Citizen writes. The invitation to the $1,000-per-head fundraising breakfast is billed "locally-produced breakfast by Alice Waters and Friends." Waters, it turns out, is a huge fan of Michelle Obama's "Let's Move" campaign, in which the fit lady promotes healthy eating as well as regular exercise as panacea to the nation's overweight and underworked schoolchildren (and their similarly out of shape parents). The invitations to the event promise "garlic toast from Acme Bread's very first Edible Schoolyard," meaning two Berkeley bonanzas for the price of one morning meal with the president's wife.